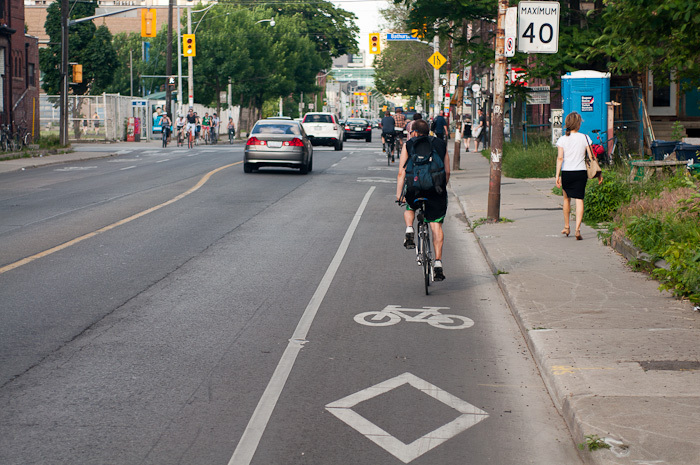 Drivers give cyclists a wider berth on streets with painted bike lanes than on streets with no bike lanes, according to a new study by a Canadian research team with the University of Waterloo [PDF]. Common sense? Sure, but it’s more evidence that cyclists feel safer in dedicated infrastructure for a reason. Researchers from the University of Waterloo measured 5,227 individual incidents of cars overtaking bicyclists using sensors and handlebar-mounted cameras. Passing at less than one meter was the threshold that the research team deemed unsafe. On two-lane roads with no bike lanes, 12 percent of motorists gave less than one meter. No drivers passed cyclists that closely on two-lane roads with a bike lane. Meanwhile, on four-lane roads with no bike lane, 6 percent of passing maneuvers were within one meter, compared to 0.5 percent on four-lane roads with bike lanes. On two-lane roads with bike lanes, motorists gave cyclists an average of 7.6 more inches of passing room, a 14 percent difference. The researchers chose streets with “standard” width of 3.65 meters for general purpose lanes and between 1 and 1.2 meters for bike lanes. This suggests that the streets with bike lanes were wider than the comparison streets without bike lanes, which may factor into the differences the authors found. “Our observations show that the presence of on-street bike lanes significantly reduces unsafe vehicle passing maneuvers and therefore improves cyclist’s safety,” write authors Kushal Mehta, Babak Mehran, and Bruce Hellinga. Another interesting finding was that motorists were less likely to cross over into the opposing traffic lane when bike lanes were present. On two-lane roads with no bike lane, 41 percent of motorists “encroached” into the opposing lane, and on four-lane roads with no bike lane, the figure was 34 percent. That was compared with 4 percent on four-lane roads with a bike lane and zero percent on two-lane roads with a bike lane. Gee, riding a bicycle in a lane that is too narrow for a bicycle and a vehicle to travel side by side safely invites motorists to pass too closely. We knew that in 1975 when we added the exception to the requirement for bicyclists to ride as far right as practicable for exactly that scenario. I am aghast that the “researchers” did not know that when the exception for a narrow applies, bicyclists may use the full right-hand lane. When they do, they are telling motorists to “encroach” into the next lane by changing lanes to pass, thus giving the bicyclist plenty of space. What’s so hard about that? The data I want to see is the passing range on roads without bike lanes that are just as wide as the roads with bike lanes. SO an academic institution is taking credit for determining 1: Wider roads (with a bike lane painted on them) are safer for bicyclists, and 2, Motorists on wider roads (with a bike lane painted on them) don’t often need to cross the center line to pass a bicyclist riding in the gutter. SO where is the control group of wide roads studied without bike lanes painted on them????? The comparison is essentially between wide roads and narrow roads which are not wide enough to have a bike lane established on them. How does this institution, this study, and those associated assume to have any credibility? I’d be more curious to hear about behavior related to door opening, considering the huge portion of our bike lanes in New York that are either completely or majority within the door zone. Now it would have been something if they did a “before and after” type study on a roadway that didn’t change curb to curb width but this study from what Angie is reporting is a bit weak. There was a study about a decade ago, I believe out of Texas, that showed the “power of lines” regarding the white panted bike lane line. According to that study, bike lanes made passes by drivers more predictable because cyclists knew where they needed to be and drivers knew where they needed to be. While I like that study, it just kind of proved the obvious. Isn’t that also the same reason why they have been painting lines on multi-lane roadways and freeways for the past 100 years? You’re not questioning their credibility – you’re questioning whether they’ve asked the right question. And that’s a perfectly reasonable criticism of a piece of academic work! We need people to do all of these studies and add them up, and not just jump at the first one and use it to base all further conclusions. Why do you think the researchers don’t know the laws? They’re just studying a different question than you want them to study (which is one that they definitely should study as well). The other useful thing about this study is that it tells us not just that motorists give less room when there is less space, but also it tells us something about what fraction of motorists give how much room in each situation. We didn’t know that it was 12% on ordinary two lane streets, and 6% on four lane streets, but now we do. I’d like to know further what the percentages are like when the right lane is wide enough for the bike lane but the bike lane doesn’t yet exist, and also what the percentages are when there is a center turn lane, either with or without a bike lane. @Dave – These are called “wide outside lanes” and have not worked out very well. It would indeed be good to see the two compared. Want Cyclists To Feel Protected? Then Protect Them! A new study shows, naturally enough, drivers are much more likely to safely pass cyclists on roads with protected bike lanes.